The "Ashi experiment" is a classic psychological experiment that studies the phenomenon of conformity. It was designed and carried out more than 40 years ago by American psychologist Solomon Ash. The term "conformity" refers to the extent to which individuals are influenced by a group to doubt, change their opinions, judgments and behaviour in order to be consistent with others. TheAshi experimentis a study of the extent to which people are influenced by others and make obviously wrong judgments against their will. The typical test material was 18 sets of two cards, one with standard line segments and the other with comparative line segments. A group of seven subjects, six of whom were lab assistants (i.e. dummy subjects), and a sixth were real subjects. The task of the subjects was to determine which of the three line segments a, b and c was the same length as the standard line x segment for each set of cards presented. All subjects engaged in an average of one-third of the total herd behavior. Psychologist S. Milgram (1963) conducted the obedience experiment, which is one of the most influential studies in his series of influential social psychology studies. The subjects were recruited by advertisements for 40 men of different occupations, who were paid $4.50 per experiment.The subjects were told that the experiment was to study the effect of punishment on students' learning.In the experiment, two groups, one as a student and one as a teacher, the role of teachers and students is determined by drawing lots. The teacher's task is to read out the relevant words of the pairing for the students to remember, and then when the teacher presents a word, the students choose one of the four alternatives. If the choice is wrong, the teacher pushes the button to inflict electric shock on the students as punishment. As a result of prior arrangement, only one person in each group was actually a real subject and the other was an assistant of the experimenter, that is, a false subject. As a result of the drawing of lots, the real subject was always ateacherand the false subject was always a student. In addition, these electric shocks were false, but in order to convince the real subject as a "teacher", before the experiment, first let theteacherreceive an intensity of 45 volts and felt as a real electric shock, but felt as a weak result. At the beginning of the experiment, the "teacher" and the "student" were separated in two rooms, separated by walls and invisible to each other. Electrodes were then attached to the arm of the "student" to punish him with electric shocks if he made a wrong choice. The experimenter taped the "student" to a chair and explained to the "teacher" to prevent him from escapingAt the beginning of the experiment, the student deliberately made a mistake, the teacher gave electric shocks, and when the student repeatedly made mistakes, the teacher's electric shock voltage went up to 75 volts, someone began to moan. As the student made mistakes, the voltage of the teacher electric shock went up, and the student shouted and yelled and begged for mercy, kicked the wall, and finally stopped yelling, as if he had fainted, the teacher simply put the recording and did not clear.As the subject of the "teacher" can not bear to continue to do, asked the main test how to do? The main test urged the "teacher" to adhere to the test, and said that all the consequences by the main test bear, and "teacher" has nothing to do with the "teacher".A further 35 per cent of the subjects resisted and refused to obey orders, which they considered to be unconscionable. At the end of the experiment, the subjects revealed the real situation and the purpose of the experiment in order to eliminate the tension, anxiety and guilt of the subjects " teachers. Psychologist Doric et al. (Deutsch, 1960) conducted a classic experiment in which two pairs were asked to act as managers of two transport companies, each with the task of getting their vehicles as fast as possible from the start to the finish line, and the faster they got, the more money they made and the more money they demanded.Each person has two routes to choose from, one is a personal lane and the other is a common shortcut, but the shortcut is narrow and can only be used by one vehicle at a time, so there is only one way to use this close and narrow road: the two sides work together alternately. The design of the study clearly tells the subjects that even if the one-way line is used alternately, there must be a little waiting time, but the one-way is far more effective than if the personal lane is activated.The results of the experiment showed that both parties were unwilling to cooperate, they met each other in a narrow way, and there were often deadlocks. Although there were occasional collaborations in the experiment, most of them were the result of competition.When the subjects were asked to explain why they would rather compete than cooperate, most said they wanted to beat the other competitors. They did not value how much they scored in the experiment and preferred to compete, outdo others and achieve self-worth, even if they got less. This experiment confirmed the assertion that people were psychologically inclined to compete. The study also shows that there is a big difference between competition among individuals and competition among groups.Under the condition of competition among groups, the work of members within a group is mutually supportive, the purpose of common activities is highly directional, communication with each other is timely, mutual understanding and friendliness, and the efficiency within a unit time.Under the condition of individual competition, most people only care about their own work and do not support each other enough. In 1968, American psychologists Rosenthal and Rosenthal&L. Jacoboson, among others, conducted a famous experiment in which students in three classes each in grades one to six of a primary school were given a so-called predictive test and told teachers, These children have great prospects in the future. In fact, the students were randomly selected.Results Eight months later, the students were given intelligence tests and found that the students on the list did improve, the teachers gave them good character comments, and the experiment had a miraculous effect.Rosenthal attributed the results to the teachers' acceptance of the "hint of an authoritative lie," a change in their attitude toward the students on the list, and a preference for psychology and emotion.This had a direct impact on the psychology and behaviour of students and facilitated the achievement of the desired effect, which he named the Pygmoliou effect after the Greek mythological protagonist. Later, it was also known as the Rosenthal effect or the teacher's expectation effect . Piaget studied the development of children's moral cognition by using dual stories based on the projection principle of the psychoanalytic school. He designed some dual stories with moral value content, asking children to judge right and wrong, to find out the moral rules they are based on from the moral judgment of children's responsibility for behavior, and the level of development of the concept of fairness that results from them.Below is a dual story used by Piaget al in his research. There was a little boy named Julian. His father went out. Julian found it interesting to play with his father's ink bottle. He started with a pen. Later, he put a small ink stain on the tablecloth. Once, a little boy named Augustus found his father's ink bottle empty. On his father's day out, he tried to fill it up to help his father. So, when his father came home, he would find it full. But when he opened the ink bottle, he got a big ink stain on the tablecloth. Piaget asks two questions about each dual story: (1) Are the two children equally at fault? (2) Which of the two children is the worse? Why? Through extensive empirical research, Piaget finds that the development of children's moral judgment is correlated with the development of their cognitive abilities, which are developed in relation to others and society.Piaget summed up a general law of the development of children's moral cognition: children's moral development is roughly divided into two stages: before the age of 10, children's thinking judgment of moral behavior is mainly based on the external standard set by others, called heteronomy morality; after the age of 10, children's thinking judgment of moral behavior can mostly be based on their own internal standard, called self-discipline morality. Newcomb (1961), an American psychologist, conducted an experiment at the University of Michigan. Seventeen college students were offered free accommodation for four months in exchange for regular talks and tests. Their attitudes and values on politics, economics, aesthetics, social welfare, and their personality traits were measured before they entered the dormitory.Students with similar and dissimilar attitudes, values, and personality traits were then mixed together in several rooms for four months. After four months, they were regularly asked to rate each other's views and attitudes on the above issues. They were asked to rate each other indoors, who they liked and who they disliked. Psychologist M. Triplett (1897) found that other people's presence or group activity significantly improved people's behavioural efficiency. He asked subjects to cycle 25 kilometres in three situations. The first was a solo cycle time, which showed that the average speed in a single time situation was 24 miles per hour (1 Inch = 1.61 km); someone accompanied by someone doing the same thing as Triplet did, and the average speed in a 31mph test run. In a classic experiment in developmental psychology called delayed gratification, participants gave each of the four year olds a tasty piece of fudge and told the children to eat only one if they ate right away, two if they waited 20 minutes to eat again.Some children were too impatient to eat the sugar right away, and some were able to tolerate it, close their eyes or turn up their heads and sing to themselves.The researchers followed up and found that those who gained two fudge candies with tenacity showed greater adaptability, self-confidence, and independence through high school, while those who could not resist the temptation of fudge tended to succumb to stress and dodge.In subsequent decades of follow-up observations, it was also proved that those who had the patience to eat two candies were more likely to succeed in their careers.The experiment proves that self-control ability is a kind of comprehensive ability for an individual to control and regulate his behavior properly, restrain impulse, resist temptation, delay satisfaction and ensure the realization of his goal persistently without external supervision. It is an important component of self-consciousness and an important psychological quality for a person to succeed. In 1954, psychologists at McGill University in Canada first conducted a "sensory deprivation" experiment: subjects were given translucent goggles to make it difficult to produce vision; the monotonous sound of an air conditioner was used to limit their hearing; their arms were covered with paper sleeve sleeves and gloves, their legs and feet were clipped together to restrict their sense of touch.......................The experiment shows that the development of the brain and the maturation of a person are based on extensive contact with the outside environment.Only through socialized contact and a greater sense of connection with the outside world can a person have more power and develop better. Avicenna, an ancient Arab scholar, had placed two lambs born of one child in different circumstances: one lamb lived happily with the flock in the water, while the other was chained to a wolf, who always saw the threat of the beast in front of him and, in a state of extreme terror, could not eat at all, and soon died of panic.Medical psychologists have also experimented with dogs for jealousy: keeping a hungry dog in an iron cage, letting another dog outside the cage eat meat and bones in front of it, and the caged dog, in a negative state of irritability, anger, and jealousy, develops neurotic pathological responses. Experiments have taught us that negative emotions such as fear, anxiety, depression, jealousy, hostility, and impulsivity can cause long-term mental and emotional problems.The more in line with one's own understanding and evaluation in life and one's own actual situation, the stronger one's social adaptability will be, the more pressure can be turned into motivation. 11. Why do people feel happy? Why do people feel pain? It is because something pleasant or painful has happened to us; we have done everything possible to satisfy our hopes of success, and so we rejoice; on the contrary, if our efforts are thwarted, we are unhappy, even miserable. In addition to the above, psychologists have discovered a number of other causes. One of the most important findings is that stimulating certain parts of the brain can also produce joyful or painful moods. It turns out that in our brain there are emotional centers that specialize in both pleasure and pain. More than 30 years ago, a psychologist named Olds used microelectrode technology to study brain function in mice. Microelectrodes are tiny electrodes that can be inserted into various parts of the brain without affecting the health or functions of animals. We can use microelectrodes to apply electrical stimulation to the inserted parts to see how the animals react. They built a switch to control electrical stimulation-the crossbar, which can be controlled by the rats themselves. As soon as the rats pressed the crossbar, the microelectrode buried near the hypothalamus produced electrical stimulation for a duration of 0.5 seconds. When the experiment began, Olds and others saw a surprising scenario: once the rats learned to press the crossbar to gain stimulation, they would exhale with an average of up to 5000 hours. Olds et al., in order to further clarify the degree of the mouse's fascination with the stimulus, purposely placed a shelf between the mouse and the bar with a strong electric current. But the mouse ignored the pain of the electric shock. Desperate to cross the shelf and pounce on the bar that would stimulate them. Orz's further experiments also showed that microelectrodes were inserted into another important part of the brain: the limbic system, where rats pressed hard against the bar. So many psychologists believe that there are pleasure centers in the hypothalamus and the limbic system. The reason why rats press the bar so hard is that they can experience cheerful emotions by stimulating the pleasure center. Later, the experiment produced similar results in the brain surgery patients at the hospital. The doctors, with the patient's consent, stimulated the corresponding brain region during the operation. They found that the patient liked the stimulation and was happy to press the switch bar if he gave it to the patient. This indicated that there was also a pleasure center in the human brain. Since there is a pleasure center, is there a pain center? Psychologists insert microelectrodes into other parts of the brain and modify the switching devices so that mice can cut off electrical stimulation when they press the crossbar. In experiments, rats are first given electrical stimulation to these parts of the brain, and they learn to press the crossbar to cut off electrical current. These parts may be the pain center of the mouse. It is assumed that there is a "pleasure center" in the hypothalamus of mice, and in the same way a "pain center" has been found. The results of this experiment caused immediate social sensation. One has to ask not only: "Are there pleasure centers and pain centers in the hypothalamus of humans?" In the 1960s, doctors Zuckerson and Townsend boldly experimented with electrodes to stimulate parts of the hypothalamus. Surprised to see stimulated patients smiling and feeling good, the findings do not fully support the existence of a "pleasure center" in the human brain, but they prompt an in-depth study of the brain mechanisms of emotion. In any part of society, we can see girls laughing. Sometimes it is a smile, sometimes a smile, sometimes a smile, and even laugh out of tears. It is strange that often do not know what they do, but actually issued a strange or meaningless laugh. Girls love laughter for its complex physiological reasons. Laughter is the external expression of feelings. The occurrence of emotions and feelings is directly related to the network structure of the hypothalamus and the limbic system of the brain. The hypothalamus is the subcortical center of the vegetative nerve. In 1954, Oder and Milner pioneered the burial of electrodes to carry out "self-stimulation"self-stimulation"experiments, which revealed the existence of" pleasure centers "in the hypothalamus and" in the hypothalamus to stimulate " in the hypothalamus to stimulate the emotional organs to stimulate the emotional response to stimulate the male brain. Another major reason girls love to laugh is complex physiological reasons. In the long history of the formation of the psychological differences between men and women, there has been a difference in character. Women's character to emotion-oriented, passive-oriented, closed-oriented, integration-oriented, submissive, attachment based, inferiority based, concealed self-oriented, so women's response to the outside world is not so sensible, active, open, antagonistic, oppositional, of course, female dominated, and prominent as one of the main factors of self-understanding. K. Z. Lorenz, an Austrian biologist, has found that certain stimuli or objects (hens, humans, or electric toys) encountered by ducklings shortly after birth imprint into their senses, causing them to have a preference for and follow a response to the first stimulus. When they encounter the stimulus later and the stimuli similar to the one, or the ducklings follow a preference for a longer period of time.This phenomenon is called "imprinting" by Laurentz and others. 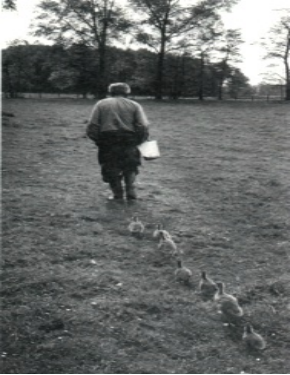 When Laurentz carried out this experiment, she allowed the newly hatched ducklings not to see the mother duck first, but to see Laurentz himself first, so that something interesting happened. Laurentz walked in front of the ducklings, followed by a few ducklings. The ducklings identified Laurentz as their mother and the other mammals, and discovered this phenomenon.Generally speaking, the critical period of "mother engraving" of chicks and ducks is found in the 10 to 16 hours after birth, while the critical period of "mother engraving" of puppies is found in the 3 to 7 weeks after birth. The study also found that animals can not only have "mother engraving" on their mothers during the critical period, but if their mothers follow the babies soon after birth, this is why they can also occur on ducks. 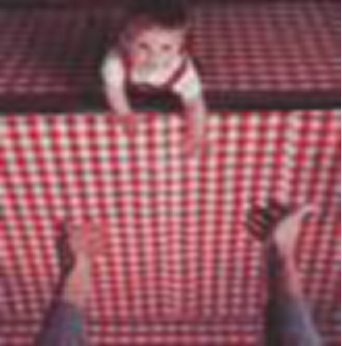 Walk and Gibson (1961) conducted an experiment designed to study deep vision in infants, the "visual cliff" (pictured) experiment, which became known as one of the classic experiments in developmental psychology. Researchers created flat checkerboard patterns, constructed with different patterns to create the illusion of a "visual cliff" and covered the glass above the pattern.Placing a 2-to-3-month-old baby's abdomen down on one side of the "visual cliff" and finding that the baby's heart rate slows down suggests that they experience object depth: When putting a 6-month-old baby on a glass plate and asking its mother to greet the baby on the other side, the baby will not hesitate to climb the side of the illusion of no depth, but the mother does not want to climb the side that seems to look like a cliff at present time to be born with deep sensation, but it is also in the opposite side. From 1924 to 1932, a group of scholars led by Professor G. E. Mayo of Harvard University carried out a series of experiments at the Hawthorne plant belonging to the Western Electric Company in Chicago, United States. In November 1924, researchers at the Hawthorne plant conducted an experimental study of the relationship between plant lighting conditions and production efficiency at the plant's relay shop. The researchers anticipated that, within a certain range, productivity would increase with the increase in the intensity of illumination, but the results showed that both increases and decreases in the intensity of illumination could increase efficiency (two women workers were found to be able to maintain productivity and productivity during periods of rest even when the illumination was reduced to a similar to that of moonlight). Mayo and others were invited to take part in the work in 1927. From 1927 to 1932, they repeated the lighting experiment by changing or controlling a series of welfare conditions, using female workers from the "relay assembly group" and the "mica chip stripping group" as subjects. The researchers realized from the fact that workers' pride in participating in the experiment greatly stimulated their enthusiasm for work and fostered a high group spirit among the team members, suggesting that worker morale and the psychosocial climate within the group were more effective factors in influencing productivity. On the basis of this, Mayo and others conducted a wide-ranging study of worker morale in 1928-2100.At first, they asked questions according to a pre-designed outline to get workers' opinions on jobs, wages, supervision, etc., but to little avail. Later interviews were conducted by workers, who expressed their opinions freely. As the interview process met the need of respect of the workers and provided them with opportunities to vent their grievances and make rationalization proposals, the morale of the workers was high, and output rose sharply.To explore the link between interpersonal relationships and productivity within groups, the researchers looked at groups from 1931 to 1932 and found that there were informal groups within formal groups that contained both invisible pressures and naturally occurring tacit understanding, as well as natural leaders, which regulated the behavior of each member. For the first time in the history of psychological research, the Hawthorne experiment has raised the issue of interpersonal relationships in industry to the forefront and reminded people to pay attention to the human factor when dealing with management problems. Mayo proposed a theory based on the Hawthorne experiment. The interpersonal relationship theory has pointed a new direction for western management science and management. However, some people have criticized the Hawthorne experiment for its lack of extra-class workers' ability to think about workers' consciousness. 16. The magic of "Mozart effect" 16, the magic of "Mozart effect"
1In 1993, Professor Gordon Shaw of the University of California, Irvine, conducted an experiment in which university students were tested for spatial reasoning immediately after listening to Mozart's Sonata for Two Pianos. The results showed a marked improvement in the spatial reasoning ability of university students, a phenomenon they called the Mozart effect. The Mozart effect has inspired people to think about ways and means of promoting brain function from multiple perspectives, and has led to a growing realization that activities traditionally regarded as "leisure", such as the appreciation of music, may have some value in the development of the brain's potential. Music: Amazing Strength Scientists have found that when people listen to 18th-century baroque music in Europe, heartbeats, brain waves, and pulses gradually synchronize with the rhythm of the music and become slow and coordinated; blood pressure drops correspondingly -- and there is a sense of relief in the general population. Experimental evidence also suggests that regular listening to baroque music may have a particularly beneficial effect on the physical and mental health, as well as preventing diabetes and heart disease. Following Professor Gordon's discovery of the Mozart Effect , they conducted a similar experiment in elementary schools.Having one group of elementary school students play a math video game about proportions and scores after piano training, and another group of elementary school students play games after English training, they found that the performance of elementary school students in piano training was 15% higher than that in English training. Some scientists believe that music appreciation includes spatial perception and spatial reasoning, which are important components of mathematical ability. Music appreciation can strengthen underlying neural structures in the human brain and thus enhance the corresponding mathematical ability-just as muscle training can enhance people's motor ability. Others believe that music may be more related to our right brain activity, and if we consciously strengthen music training, we can correspondingly improve the work efficiency of the right brain. The magic of music goes beyond that. Doctors often find that patients with Parkinson's syndrome are slow to act and react, but may miraculously regain some of their functional gifts when listening to music, or even thinking about it in their heads. This suggests that while discoveries such as the "Mozart effect" have yet to be confirmed by further scientific research, there may be a gradual disconnection between musical functions and the power of the brain. Zeignik life was tried to do 20 specified work, half of the work is allowed to complete, half of the work is stopped halfway, not completed. 32 people were tested. The results found that the recall of unfinished work is better than the recall of completed work. If RC represents the recall of completed work to get the number of pieces, RU represents the number of unfinished work, P is almost equal to two kinds of recalled work. Why is the amount of unfinished work better than the amount of completed work? It may be thought that this is due to the emotional shock of unfinished work. But if the work is handled in three ways: one is allowed to be done, and one is prevented from being done in the middle. The results show that the amount of recollection of work done after being stopped in the middle is better than both. This is not only the amount of mental tension which is prevented from being done in the system. At 3:20 p.m. on the night of March 13, 1964, in front of a suburban New York apartment in the United States, a young woman named Juno Bibai was assassinated on her way home from work in a bar. "Somebody's going to kill somebody! Help! Help!" she cried in despair.Hearing the shouting, the nearby occupant lit up the lights and opened the window, and the killer scared off.When everything had calmed down, the murderer returned to his crime, and when she shouted again, the nearby occupants turned on the electric light, and the murderer fled again.When she thought she was done and went back to her house to go upstairs, the murderer appeared in front of her again and killed her on the stairs.In the process, despite her loud cries for help, at least 38 of her neighbors went to the window to watch, but none came to her rescue or even called the police.This incident caused a stir in New York society, but also caused the social psychology workers attention and thinking, people call this phenomenon of a large number of bystanders to die the scattered effect of responsibility. Psychologists have conducted numerous experiments and investigations into the causes of the dispersal effect of responsibility, and found that:This phenomenon cannot be said to be merely a manifestation of the callousness of the population, or of the growing moral decay.Because on different occasions, people's acts of assistance are really different.When a person is in an emergency situation, if he is the only one who can help, he will be aware of his responsibility to help the victims.If he sees death will produce guilt, guilt, which needs to pay a high psychological price.And if a large number of people are present, the responsibility for helping the requestor is shared, resulting in a fragmentation of responsibility,Everyone shares very little of the responsibility, and the onlooker may not even be aware of his own share,The result is a "I do not save, others to save" mentality, resulting in a "collective apathy" situation. How to break this situation, this is a psychologist is studying an important subject. The learned helplessness effect was first discovered by Overmere and Siligman and was later widely explored in animal and human studies.In short, many experiments have shown that dogs can be trained to cross barriers or engage in other behaviors to avoid being subjected to electric shocks.However, if the dog was previously subjected to an unpredictable (not knowing when it arrived) and uncontrollable electric shock (such as if the interruption of the electric shock did not depend on the dog's behavior),When the dog later had a chance to escape the electric shock,They also become powerless to flee, and the dogs show other flaws, such as feelings of depression and depression, reduced initiative, and so on. The dogs showed this condition because they learned a sense of helplessness early in the experiment.That is, they recognize that they cannot control the termination of an electric shock no matter what they do.In each case, the termination was under the control of the experimenter, and the dog learns a sense of helplessness by recognizing that it does not have the ability to change this external control. If people have learned helplessness, it has become a deep despair and sorrow.Therefore, we should open our eyes a little bit in our study and life, see the real decisive factors behind the events, and not plunge ourselves into despair. Witnesses, in our knowledge, are usually people who give some objective evidence, who tell truthfully what they have seen with their own eyes and heard with their own ears.However, psychological studies have proved that many witnesses give testimony that is less accurate, or that they are personally tendentious, with a personal point of view and consciousness. The witness's confidence in their testimony does not determine the accuracy of their testimony, a surprising finding.Psychologists Perfekot and Hollins decided to take a closer look at this conclusion.In order to examine whether the witness's testimony had anything special, they compared the witness's memory with that of general knowledge. They were shown a short video of a girl's abduction.The next day, the subjects were asked questions about the content of the video and asked to say how confident they were in their answers, followed by a recall test.Next, using the same method, the content is selected from encyclopedias and popular books on general knowledge issues. As has happened before, Perfekot and Hollins also found that, in the accuracy of the witness's recollection,Those who are confident of their answers are actually no better than those who are not.But that's not the case for general knowledge, where people with high confidence recall results much better than those with low confidence. People are self-aware of their strengths and weaknesses in general knowledge.As a result, they tend to revise their test results for the Confidence Scale.General knowledge is a database, shared among individuals, with recognized correct answers that subjects can measure on their own.For example, people will know if they are better or worse than others when it comes to sports.However, sightings were not affected by this self-knowledge. For example, overall, they were less likely to know that they were better or worse at remembering the hair color of the participants in the event than others. 21. how to praise the child? Have two groups of children at the same level do a relatively simple math problem at the same time so that they both get the right answer. Then say to one group of children: You're so smart. To the other group of children: You work so hard. Then two groups of children at the same time to do more complex difficult math problems. As a result, the first group of children who had been praised for being "smart" generally had lower grades, while the second group of children who had been praised for their "hard work" generally had higher grades. 22. Which is more objective, to evaluate oneself or others? Before making a donation, do a questionnaire and ask two questions: Question 1: Will you donate? 60% of the people replied, "I will donate." Question 2: Do you expect others to donate? 50% of the people answered, "Others will donate." After the donation, the statistic was:50% of the people contributed. The subjects were slow to respond when they were asked to write in red in green ink. Let be tried to write green words in green ink, the subjects reflect faster. The subjects were asked to write three 2 words and then told how many 2 words they had. As a result, the subjects responded more slowly. The subjects were asked to write three words and then told the researchers how many 3 words they had. As a result, the subjects responded more quickly. One of the questions is, how would you react if you were that man in red? The options are: (1) very angry, for tat. (2) very angry and walk away helplessly; (3) not angry, walk away. The result: The vast majority of the subjects chose to "walk away very angry and helpless." Question two, how do you expect the man in red to react? The result: The vast majority of the subjects chose "very angry, for tat." Ask a group of poor children to draw a coin, and poor children generally paint the coin larger than the real one. Ask a group of rich people's children to draw a coin. Rich people's children generally draw the coin closer to the size of the real coin. Having two groups of people look at two images of cars colliding, one sees the sentence shown on the footage: ' Two cars collided badly ' and the other sees the sentence on the footage of ' two cars rubbing against each other '. Then ask them to answer the same question separately: How fast is the car?The result of the reply: The group that saw "two cars colliding badly" were generally thought to be fast.The group that saw the "two cars rubbing against each other" generally agreed that the cars were not that fast. A week later, let them recall if there was broken glass on the ground after the crash.The result: The group that saw "two cars colliding badly" generally believed there was broken glass on the ground.The group that saw "two cars rubbing against each other" generally believed there was no broken glass on the ground.Of course, the real footage shows no broken glass on the ground. 27. Are Americans really free from racism? The researchers asked the subjects to shoot at targets painted with various images. As a result, there was no hesitation when subjects shot portraits of animals other than dogs, a slight hesitation when subjects shot portraits of black people, and the longest hesitation when subjects shot portraits of white people. 28. Is First Impression Important or Second Impression Important? When encountering uncertain multiple-choice questions, candidates often choose an answer based on their first impression, but later when they look back at the test paper, they feel that the first impression is not right, after scrutiny, giving up the first impression and making another choice. Should candidates respect first impressions, or should they trust their own reasoning or scrutiny?This is a difficult problem, if not for all teachers, at least for English teachers before the college entrance examination. According to experience, English teachers always remind students before the college entrance examination: When encountering uncertain multiple-choice questions, it is best to believe your first impression. However, when students encounter uncertain multiple-choice questions, should they really make choices based on their first impressions? Some psychological researchers have done relevant experimental research, the results show that: according to their own reasoning to make the right choice is much higher than the right choice based on the first impression of the correct rate. 29. Think about the mistakes you've made or the glories you've achieved. What better way to improve your students' test scores? There is a hypothesis: before the college entrance examination, if a teacher tells a student to think back to the mistakes he once made, so that he can avoid making the same mistakes and can improve his exam results as a result. There is also another hypothesis: Before the college entrance examination, a teacher who tells his students to recall the most brilliant events he has ever obtained can make himself more confident and can improve his exam results as a result. Which hypothesis is right? Some psychological researchers have done relevant experimental research.The results showed that before the college entrance examination, teachers who told their students to recall the most brilliant events they had ever obtained could make themselves more confident and improve their test scores as a result. Hypothesis 1: People are powerful. Hypothesis 2: More strength than small-a monk carrying water to eat, two monks carrying water to eat, three monks no water to eat. Let one man and another pull the river. Set a tensile detector where the tug of war holds the rope. At this time, the tug of war puts out the greatest strength. Let two and two others tug of war. Also, set a pull detector where the tug of war holds the rope. At this point, the tug of war exerts less force than in the first experiment. Let ten men and ten others tug of war. Also, set a pull detector where the tug of war holds the rope. At this point, the tug of war exerts less effort than in the first experiment.